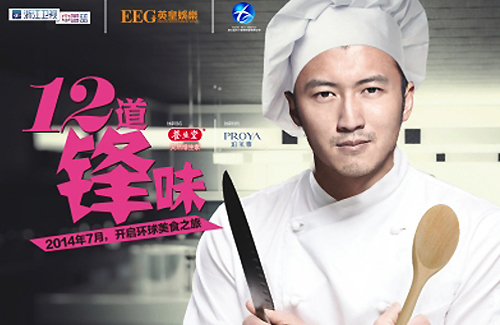 Nicholas Tse (謝霆鋒) has always had an interest in cooking. In recent months, the Hong Kong actor decided to put his skills to good use by starring in Chef Nic < 12道鋒味>, a Mainland food travelogue show in which Nicholas chats with his celebrity friends about regional foods. As the creator of the series, Nicholas oversees all aspects of the program’s video production, ranging from location scouting to the script. Nicholas’ manager, Mani Fok (霍汶希), also gave a lot of input on the show’s production and guest list. At 12 episodes, each segment of Chef Nic will run for 75 minutes. The theme of each episode will focus on the stories behind a selected dish. Nicholas invited Vicki Zhao (趙薇) to a French winery, Fan Bingbing (范冰冰) to Paris, Gwei Lun Mei (桂綸鎂) to Singapore, Charlene Choi (蔡卓妍) to Spain, Jaycee Chan (房祖名) to Milan, and Nick Cheung (張家輝) to Victoria, Australia. Rumors say that Nicholas plans to invite his father Patrick Tse(謝賢), Joey Yung (容祖兒), and ex-girlfriend Faye Wong (王菲) on the show as well. On May 25, Nicholas and Angelababy (楊穎) filmed an episode of the show at a Portuguese restaurant, Albergue 1601, in Macau. In the evening, Nicholas took Angelababy to the Michelin-starred French restaurant, The Tasting Room by Galliot, and dined there until midnight. When filming was completed, Nicholas walked with Angelababy back to the Grand Hyatt Hotel, where they were both staying at. Angelababy was featured on the show because Nicholas was aware of her rising popularity in mainland China, due to her relationship with actor Huang Xiaoming (黃曉明). Busy with her filming projects in both mainland China and Hong Kong, Angelababy had to rearrange her schedule in order to appear on Chef Nic. Grateful of Angelababy’s support, Nicholas decided to choose nearby Macau for her convenience. Though Nicholas and Angelababy both starred in the 2009 film Hot Summer Days <全城熱戀熱辣辣>, their friendship did not begin until some years later. According to reports, it was Nicholas’ ex-wife, Cecilia Cheung (張柏芝), who formally introduced Angelababy to Nicholas. When Angelababy first debuted, she had professed numerous times that she regarded Cecilia as her idol, and for this, Cecilia had also paid extra attention to Angelababy. Nic should finish high school instead of showing off like this. I have a feeling he has no idea what to do with his life, so he starts into various things. What are you talking about? He ‘s making millions just from his production company. He has an entrepreneur mindset. You should do a little research. COOKING is a hobby of his. He cooks for his friends and employees all the time……. School is not the only way to learn in life. People can learn through experience. I rather hire someone with lots of experience instead of someone that has a doctor’s degree with no real life work experience. If you are young, take this as an advice. Don’t put all your eggs in just going to school and getting the grades. Education opens the door to opportunities. You learn life anywhere you go. Partake in things that will help develop in areas outside of school and grades. Play a sport, travel the world, find a job, study abroad, etc. It’s not always about making the highest marks and getting into the best institution. Yup, they are fine but at the end of the day they don’t pay your bills or put food on the table. You must have money to do all that. Okay, getting tire and outta here. LOL! Why does someone who is making millions from his OWN production company need to go back to school? You’re joking right? Nic is never bored, I found he like to get his hands on everything, and don’t settle for that 1 thing. Also, my partner didnt even go to uni, and is in a lot higher position in his company than all those that actually went to uni and got a degree. It’s about the mindset, some ppl knew they won’t get what they want from school, so why bother wasting time. I got a higher degree than my partner, but he’s way better than I am in everything. And I think Nic is like my partner, one of those bright one, who knew from the young age what direction they want to take in life, and continually striving for that, and not settle down or for anything. I was so impressed with his talk in 2012 at HKUST on his entrepreneurial success (all conducted in English). There is a link on YouTube, look for “Nicholas Tse gives a talk at HKUST (謝霆鋒香港科技大學講座)”. He was articulate, funny and very straight forward! He is one smart man who proved that one can be successful without a college education, who ceased the opportunities and worked hard. Hats off to him! Looking forward to his cooking show and seeing another side of this fascinating man! Agree, his talk was engaging. The ninja shoot is etched in my mind lol. Wish he would come to my school. Yes, but he also stressed how much he regretted not completing his education and encouraged all the young people in the audience to do so. It is possible to be successful without an education but I think you have to work 10 times harder to prove yourself. If someone doesn’t know you, they have nothing to go by but that diploma. Even if you are smarter than the person with more education, you still can’t get anywhere until someone gives you a chance. Nic sure proved himself and he should be so proud of his accomplishments! He did not use his fame to pull in business. He was smart enough to recognize a need and ran with it! I hope he will hold a concert soon! Would love to see him in a live performance! Very star studded cast, it seems he has alot of face. The episode with Joey had been filmed, I believe, in Switzerland.